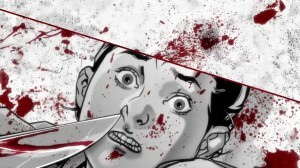 Afro Samurai 2: Revenge of Kuma Volume 1 is absolute garbage. Not many expected a sudden sequel to the 2009 original, but I doubt that anyone could predict that it would be one of the worst games of all time. 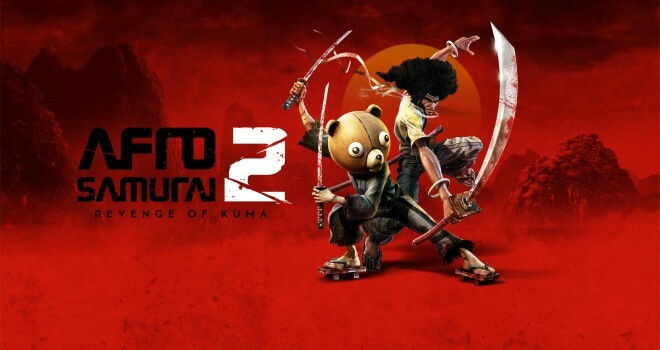 Afro Samurai 2 follows a character named Jinno, also known as Kuma, in a story that even die-hard Afro Samurai fans will find difficult to follow. Within lies a confusing tale about revenge involving a dead little girl, a creepy old man, a large man with hammers, women who are naked for absolutely no reason, and a final foe with an ear-bleedingly loud voice. Every cutscene is awkwardly scripted, and they often show up in the middle of gameplay. About half of the game is full of characters spouting monologue for way longer than necessary. Also, this game has some of the worst voice acting that I’ve heard in any game in a long time. Voices are often unfitting, repetitive, or just outright horrid. Afro Samurai 2 features cutscenes, voice acting, and a script from the bottom of the barrel of quality. As far as graphics go, I have seen better looking PS2 games. Although the cel-shading does help it out a bit, everything still manages to be ugly. The character models are lifeless and move awkwardly, and the backgrounds and foregrounds are dull and uninspired. The PS4 version also had some of the worst frame rate drops I have ever experienced. Often the game would drop to only a few frames per second for seemingly no reason, and it would make some sections nearly unplayable. Cutscenes are mostly made up from still images. They are well drawn enough, but they are presented as a slideshow and rarely animated. The menus also have hardly any sounds or music to accompany them. It’s incredibly lazy. Regardless of all of that, though, gameplay is the most important aspect of a hack-and-slash title, and Afro Samurai 2 fails in every single way possible. The action is superbly unresponsive. The game will only recognize your button presses when it feels like it. The game’s first six chapters are largely pointless. Until the last three chapters, the game mainly consists of terrible cutscenes because those early chapters only have five or less enemies to face in each. The developers tried to add depth to the combat, but they failed miserably. There are three styles of combat that you can choose on the fly with the d-pad. It sounds like a nice concept, but it is largely a pointless annoyance. Many enemies can only be killed with a certain style, so you will have to change back and forth awkwardly from each style to pull off a specific move. There is really no reason why the move sets had to be separated like this, not to mention the fact that you can only change to other move-types while you’re standing still, so it’s incredibly awkward to have to find somewhere to stop and change, while you’re being swarmed by enemies. 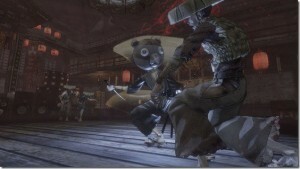 Kuma can also pull off finishers to kill an enemy instantly after the combo meter gets to a certain number. This system is hilariously unbalanced considering one of the finishers only requires a combo of five and kills nearly every enemy on screen. It makes this game insultingly easy. Afro Samurai 2 also has gameplay so bad that it will go down in history as legendary. The game’s AI is some of the dumbest I’ve ever witnessed. Enemies only know how to lunge at Kuma, or wander around aimlessly. Hammering the square button is enough to take care of the majority of enemies. Oh, and there’s also absolutely no camera control. The right analog stick does absolutely nothing. You are sadly stuck with the horrendous camera angles that the game decides to use. The game has two “bosses” that you defeat by completing the worst quick time event segments I have ever witnessed. They come out of nowhere and go on for way too long. A lot of the gameplay also consists of slowly crawling and awkwardly climbing walls. The wall climbing mechanic comes straight out of God of War, but instead of completely copying it, the developers decided to make it horrible. Also, the jumping is absolute rubbish. You can’t move in the air after dedicating to a certain jump. There’s very few platforming segments in this game, but they are made more frustrating as a result. You also have a skill tree that you can use to upgrade Kuma’s moves, but the effect is hardly noticeable. In the last three chapters, you are bombarded with skill points for seemingly no reason. In fact, you get more skill points than is even necessary to fill out Kuma’s powers to maximum. Some of the upgrades are also not unlockable in Volume 1, and they won’t be usable until Volume 2. The final boss also strangely ends in the middle of fighting her with a “To Be Continued…” message. Wonderful. It is incredible just how full of glitches and bugs are in this game that could have been easily ironed out. Common glitches include, getting stuck on the game’s geometry requiring you to restart a stage, enemies falling through the ground or phasing through walls, strange visual glitches in gameplay and cutscenes, and camera angles that allow you to see through walls. The worst glitch of all, however, is one that sometimes makes enemies completely invincible. There was a certain enemy who refused to die despite the fact that I got a 200+ combo on him. I had to exit the game and restart the level multiple times in order to fix the bug. Whether these glitches came from inexperience or laziness, they are completely inexcusable. The soundtrack is surprisingly decent. It mostly consists of some passable rap and hip-hop tunes, coming from hip-hop alumni RZA of the group Wu-Tang Clan. The only bad thing is that the songs repeat pretty often. In general, however, the sound mixing is very poor. Sound effects and voices are often either too quiet or so loud that they could blow out your speakers. It is also odd that some of the voice actors clearly had vastly inferior microphones than others, which causes for some awkwardly low quality sound. 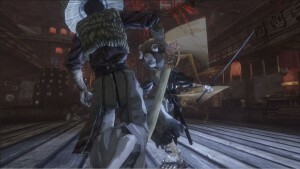 From horrendous, unresponsive gameplay, terrible sound and voice acting, game-breaking glitches, and uninspired visuals, Afro Samurai 2: Revenge of Kuma Volume 1 is a disaster. Despite the decent soundtrack and the glitches which do make for an ironic laugh, this game is not worth anyone’s time or money. Even if you are a fan of the source material, avoid this game at all costs. It’s simply not worth it. I’ll be shocked and appalled if either of the planned future volumes are ever even released. What horrors could await in those chapters? Frankly, I really don’t want to know. Afro Samurai 2 will go down in history as a legend… as one of the worst video games ever made.